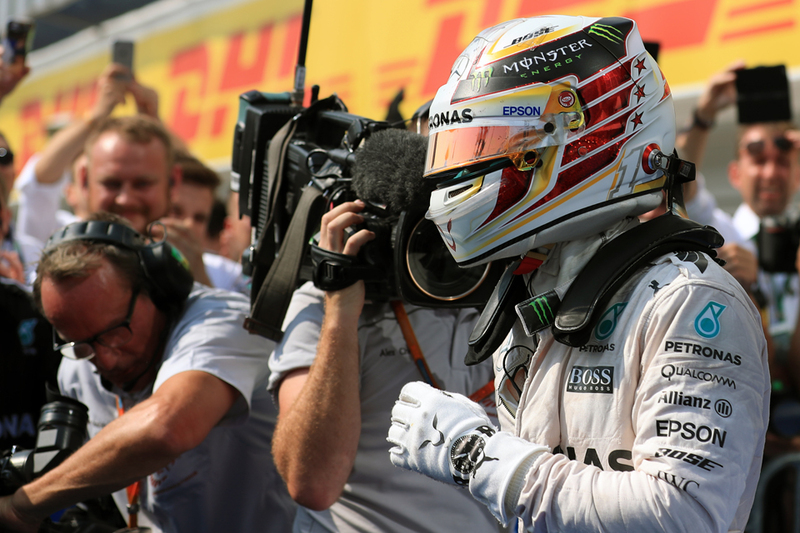 It was all the fives for Lewis Hamilton. 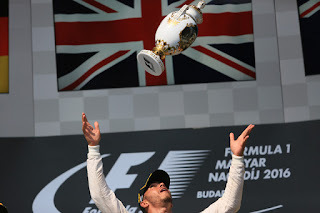 His fifth Hungarian Grand Prix win. His fifth win from the last six races. And if his previous weekend at Silverstone had a lot of the 'red five' Nigel Mansell about it, this one was more like another, less celebrated, Williams pilot from the past with a number five on his car. Thierry Boutsen, who claimed one of his three F1 wins by taking pole at the Hungaroring in 1990, then simply repelling all attacks all race from those behind and never making a mistake, on this one of the toughest tracks to pass on. That's loosely what Lewis did today. He didn't look the fastest out there the whole time - perhaps a legacy of his momentum lost from his Friday practice crash - but on the sinewy Hungary track position is not so much nine-tenths of the law but ten-tenths. Or should that be five-fifths? Lewis fully exploited that fact, controlling things out front and winning at the lowest possible speed. We shouldn't be too disparaging either, even the man Lewis reveres, Ayrton Senna, won more than one Hungarian race this way. That's the game here. 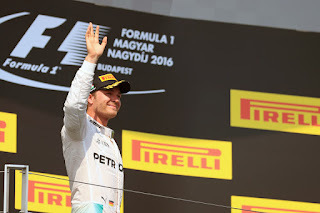 After qualifying in which Lewis had pole nabbed from under his nose at the last by his team mate Nico Rosberg, it appeared for the reasons above among others that it was going to be a long Sunday for him. 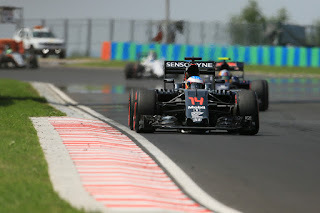 Overtaking was off the agenda virtually, while Mercedes as we know usually gives strategy preference to the car ahead. That left the start, not always the most fruitful line of attack for Lewis this season, as about his only opportunity to get ahead. But this time, one way or another, it worked for him. His launch was great, better than Nico's, but he seemed to lose momentum in the second phase (the man himself said he was "just being cautious with the wheelspin" knowing he had a good launch) and Nico edged back ahead and Max Verstappen attacked from behind, as did the other Red Bull of Daniel Ricciardo on the outside. But Lewis had the inside line and was able to claim the lead with a brave late-braking manoeuvre, and that oh-so nearly resulted in yet more contact with his team mate after he locked his rears. The day, suddenly, had turned. "With the race, the start was everything" said Lewis afterwards, not for nothing. His stable mate concurred: "The race was decided there," said Rosberg of the launch. 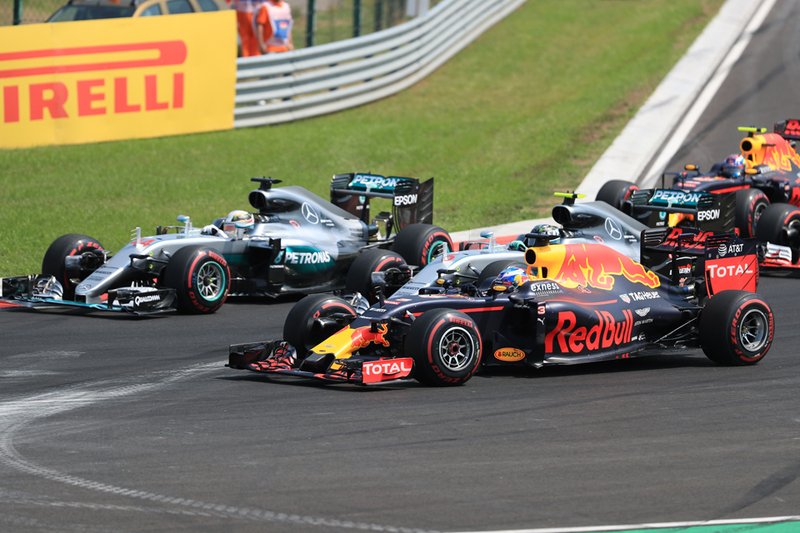 "My start was okay but slightly down on Lewis's start and Daniel also and then Daniel got a tow and Lewis had the inside line and I lost out into Turn 1. "It got a bit tight between the two of them and I had to back out. I'm glad to get second back from Daniel at Turn 2, that was cool, but I lost the win there." From then on it was as described, Lewis controlling things out ahead, and there not being an obvious way of dislodging him. Rarely did he look like he would run away; sometimes Nico looked positively faster, particularly just after the first stops when they'd switched to soft tyres and Lewis admitted on the radio that he was "struggling for pace". Then later some wondered if Lewis was seeking to 'back up' Nico into the pursuing Red Bulls and Ferraris, a group which included his team apparently as his engineer threatened to give Nico strategy preference if Lewis didn't get a move on. In the final stint Nico got close again in traffic, with Esteban Gutierrez doing a particularly convincing mobile chicane impression. Each time though Lewis was able to move away again quite quickly, suggesting he had more in hand if he needed it. And he confirmed as much later. "I couldn't feel better" he said of his win. "I needed a day like this, the weekend hadn't been spectacular, and yesterday obviously I was easily quick enough to get pole and then kind of unfortunate not to get it. But then I needed a good start today which I did...After that it was just about managing it. "During the race I was turning my engine down quite a lot" he said with his oft-noted future penalties in mind, "I was able to maintain that gap most of the time...when he [Rosberg] started to pick up a little pace eventually I had to come back with it [the engine]. I didn't need to win by five-ten seconds, all I had to do was make sure I win". As for his mid-race strategy discussions with his team, "I was chilled the whole time, and I just said to them [the team] 'just be chilled', I've got this, I know what I'm doing, I'm utilising the tyres, the fuel, to the point that when I really need to push, hopefully at the end of the stint, hopefully I'll have the tyres left to do so. "To win a Grand Prix and have a so-so weekend, I'm pretty happy with that!" Indeed, the scrum wins against the head often can be the most satisfying. And decisive. He insisted not though. "It is very close. 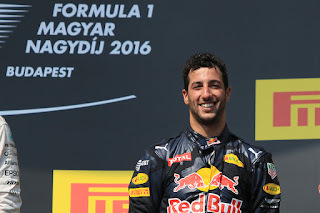 It has been a good season so far, up until now," Nico said later. "As I always said, I am not counting points, I am focused on winning races...Now I am looking forward to Hockenheim and being focused on winning the race there." It was a bigger deal though for Lewis "it's huge for us" he said of him and his 'side of the garage' turning around the points situation, "we've done so much with so little, we've got to where we are with much less engines which we're really proud of". The Red Bulls hung on gamely as intimated today and as also predicted the Ferraris came on stronger in the race. Daniel Ricciardo drove well to third and had Sebastian Vettel right behind at the end. Seb reckoned he might have passed had it not been for, you know, where we were. "I think we were a lot faster, but we know as well this is Hungary and we need to be not just a lot faster" he said ruefully. Daniel was though particularly relieved to end a run of difficult races in which he'd been beaten by his young whipper-snapper team mate. "For sure the smile's back" he said afterwards. "For me personally, I needed a good Sunday...Probably since Barcelona, Monaco, didn't really feel I was leaving Sunday very satisfied for one reason or another, so was just important to put together a perfect weekend from my side, and obviously that's translated into a podium". There was though more intrigue with Danny and Seb's team mates. 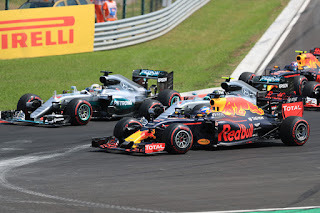 Max followed Daniel in the first stint, and was ahed of Seb, but a slow first stop put him behind not only the German but also his Ferrari team mate Kimi Raikkonen, who was recovering from a P14 start and employing a contra-strategy. This spoiled Max's day somewhat. Later on though we had a role reversal as Max in P5 had Kimi attack him on fresher, softer tyres in the final stint. And as is his way Max took things to the max, with one move (or possible two moves at once...) inciting Kimi's ire. Kimi reckoned his young foe was guilty of 'two moves', though from the exterior shot the second move looked more subtle than it did on board. Max often is a little rude in battle but he also seems to have a knack of pushing the limits without quite breaking them. He also has fending off verbal criticism with a straight bat down to a nicety too. "No, I have no issues" Max maintained later, "I think everything was fair. I only moved once. Will be very strange if I get penalised I think". Whatever is the case, the stewards left it alone and they finished in that order. For Fernando Alonso it was a case all seven and we'll watch them fall. Having ended up seventh in each practice session this weekend as well as qualifying seventh, he finished...well you can guess that one. His conversion of a two-stop race was near enough perfect, he only lost a place from the starting order to the recovering Kimi and having passed Carlos Sainz off the start kept him at arm's length throughout. Nando described his race as "a little bit boring" but also "the best result possible" as "Mercedes, Red Bull and Ferrari are out of reach". His McLaren team mate Jenson Button got attention for the wrong reasons though, as after five laps (five again?!) his brake pedal went to the floor and he dropped down the order, which turned out to be down to a hydraulic problem. He was told by his engineer not to shift, before the problem corrected itself and he came in to pit which it seems McLaren thought was in line with the new and notorious radio restrictions. But according to the stewards seemingly the instructions had to come during the stop, not before, so Jenson got a drive through penalty on top of everything else. Jenson and others argued that given the problem affected the brakes it was all a safety issue. We haven't heard the end of this one. He dropped out eventually with an oil leak, thus becoming the day's only retiree. In F1 things can change very quickly, and with the modern helter-skelter calendar this is especially so. This current packed run ends next week with the German race, before a summer break, which itself is followed by another tin of sardines-like schedule. Even with this though Nico in that one opportunity before the summer hols, in his home race of sorts, you feel simply must do something to check his team mate's ever increasing momentum. Matters are getting critical.